An obstacle course for human lung cells could be the answer for better testing the effectiveness of potential new drugs. 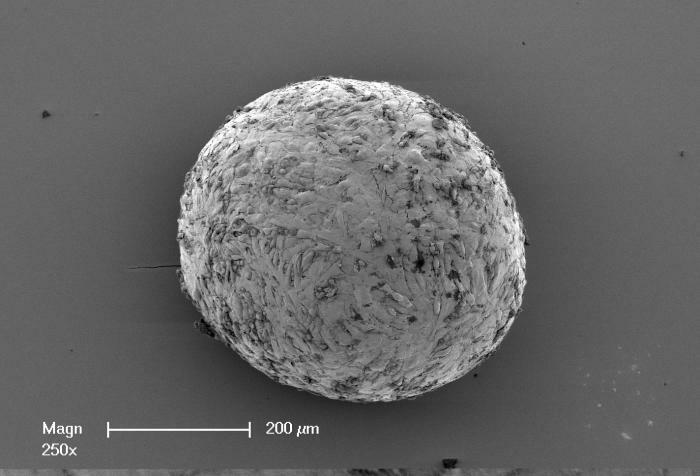 The spheroid is the width of a few human hairs and made up of 25,000 human lung cells clustered together with iron particle, suspended in a fluid that runs though a microscopic obstacle course of channels sealed between glass. It is a science fiction-like biological machine and testing ground housed “on-a-chip” that is being developed by University of Melbourne scientists in a bid to monitor human tissue in an environment that mimics the mechanics inside our bodies, including the mechanics of breathing. The project could help radically improve how we test whether a new drug will work and in the process save the medical industry hundreds of millions of dollars a year. test its mechanics. Video: Fernando Rafael Jativa Guzman, University of Melbourne. Using magnets the scientists plan to manipulate the iron particles and stretch the lung tissue by dragging the spheroid around corners and squeezing it down corridors. And by using quantum physics the scientists will be able to watch how drugs interact with healthy and diseased cells. Underneath the glass they plan to place a thin sheet of diamond, the structure of which has been modified with atomic defects that can be used to image the magnetic fields cast by the embedded iron particles, effectively imaging the cells themselves. “What we are trying to do is add another level of reality to drug testing,” says the University’s Professor Alastair Stewart, a pharmacologist at the Faculty of Medicine, Dentistry and Health Science and co-director of the Lung Health Research Centre. Pharmaceutical development depends on mouse models or on two-dimensional cultures for testing the potential effectiveness of a drug before progressing to expensive human trials. But these tests are failing to identify the many drugs that go on to fail when finally tested in humans. A review of pharmaceutical giant Astra-Zeneca’s portfolio performance between 2005 and 2010 suggests that failure rates when testing for effectiveness in humans can be as high as 85 per cent. The wasted money can range from $10 million to $100 million per failed drug. 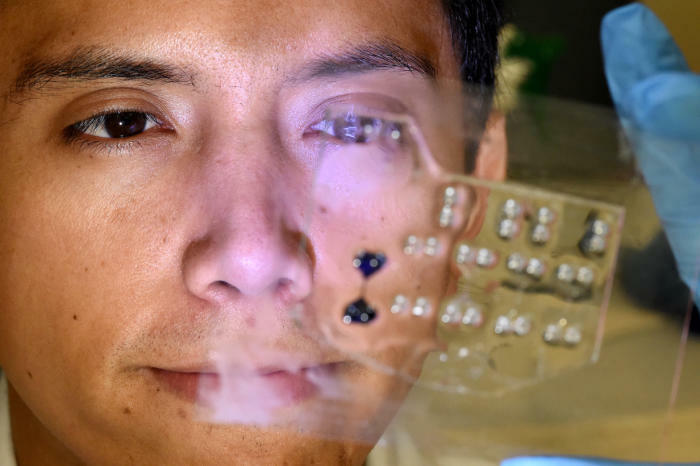 Fernando Rafael Jativa Guzman, PhD candidate within the University of Melbourne’s School of Engineering, holds a version of the “on-a-chip” obstacle course for lung spheroids showing chambers and connecting corridor highlighted with blue dye. Picture: Paul Burston, University of Melbourne. 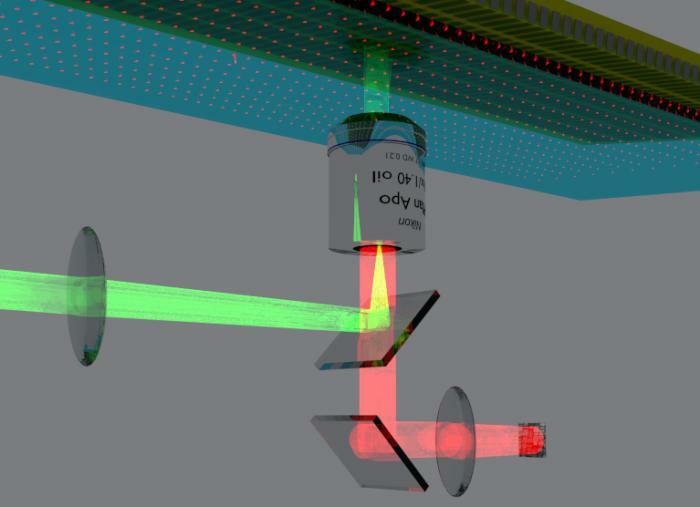 But by introducing drugs to human tissue inside the three-dimensional obstacle course and monitoring what happens, researchers aim to be able to better determine whether a drug can work or not before ever having to undertake expensive human trials. In this case the researchers are working on pulmonary fibrosis, a disease in which lung tissue is scarred and stiffens making it difficult to breathe. It is a progressive and fatal disease for which we don’t know the cause, but is linked to smoking. “There is significant unmet need for new drugs to be developed that can combat this fatal lung condition,” Associate Professor Glen Westall, a leading lung fibrosis expert at Alfred Health and a partner investigator on the research. Through the University’s cross-disciplinary Hallmark research initiatives, Professor Stewart has teamed with bioengineers and quantum physicists to work with Australian-based global biopharmaceutical company CSL Limited in developing the “micro-tissue on a chip” model. They plan to use it to test a series of different anti-fibrotics in what would be the first systematic benchmarking of whether such models can accurately fail ineffective drugs. The research team is focusing on fibroblast cells that form the connective tissue in our bodies and which, when fibrosis occurs, produce too much of the connective “glue” that binds tissue and therefore causes it to stiffen. By being able to move a spheroid of diseased fibroblasts through the corridors on the chip and use the magnets to replicate breathing, the researchers will be able to monitor what is going on at a cellular level when the tissue stiffens. The lung cells are made available through collaboration with Alfred Health and Donate Life. Diseased lung cells are harvested from patients with lung fibrosis who have undergone a lung transplant, and healthy cells come from donor lungs that for various reasons haven’t been suitable for a transplant. Technology to create tissue and organs “on-a-chip” is at the forefront of medical research aimed at replicating what is going on in our bodies. But so far, while researchers around the world have been working to perfect the action of whole organs in a micro-fluidic chip environment, Professor Stewart says the accuracy of such models in being able to “fail” potential drugs is yet to be proven. “There are many aspects of organ-on-a-chip technology that remain a matter of belief rather than of evidence,” he says. Rather than trying to replicate a whole organ-on-a-chip, such as a lung, bioengineer Professor Peter Lee says the project is focused on creating a testing system specifically adapted to the area they want to test, in this case lung fibroblasts. Critical to the project will be the ability of the researchers to “see” at high magnification what is going on in the spheroid as it is put through the obstacle course and interacts with drugs. That is where the quantum physics comes in. In 2013 University of Melbourne physicist Professor Lloyd Hollenberg won the Victoria Prize for his work in using quantum physics to create nano-scale sensors. These sensors are the size of a single atom embedded in diamond crystal, and when engineered as a two dimensional grid just below a diamond surface they can image magnetic fields at resolutions a million times better than traditional magnetic resonance imaging (MRI). Crucially, the imaging can be done without exposing the tissue to direct light that would be toxic for the cells. The imaging technique uses a thin sheet of synthetic diamond crystal about four millimetres square. To create the sensors the researchers remove two carbon atoms from the usual diamond structure, replacing them with one nitrogen atom and leaving an atomic space, or vacancy, where the other carbon atom should be. The combination of the nitrogen atom, the vacancy and an additional electron creates the so-called Nitrogen Vacancy (NV) defect, which acts as the sensor. When green light is shone onto the diamond surface the NV defects reflect back red light, the strength of which is dependent on the local magnetic field. Simplified representation of the quantum magnetic microscope arrangement that can be used to image cells. Picture: Dr David Simpson, University of Melbourne. In addition the NV defects can be put into a quantum state, i.e. it can exist in two energy states at once – grounded and excited. Once in this state of “superposition” the NV is highly sensitive to picking up any magnetic fields around it. When the tissue chip is placed on the diamond-imaging chip, the NVs will pick up the magnetic fields of iron particles embedded on the cells. Using the variation in the power of the red light reflected back, the scientists will pinpoint the source of the magnetic field and therefore image the cells. “By imaging the position of the beads using their magnetic fields, and then moving the beads to mimic actions like breathing, we can watch what is happening and how stiff or soft the cells and tissue may become in response to drugs,” says Dr David Simpson, research fellow in quantum physics at the School of Physics who has built the quantum sensor microscope system. Ultimately Professor Hollenberg wants to take the imaging technique further down in scale to be able to image the single proteins in cells that regulate our tissues and organs. That could allow us to accurately understand and predict how a drug or a potential drug will work in the body. Banner Image: A version of the “on-a-chip” obstacle course for lung spheroids showing chambers and connecting corridor highlighted with blue dye. Picture: Paul Burston, University of Melbourne. This article was first published in Pursuit on 12 September 2016. View the original article.